Halters Cycles » Blog Archive » Night time.. Yep it is dark! Better light up! Night time.. Yep it is dark! Better light up! As the days have gotten shorter we find ourselves riding in the dark more often than we might prefer. They make lights that use HID, LED and Halogen bulbs. We will be stocking these 3 models all winter. Finally! 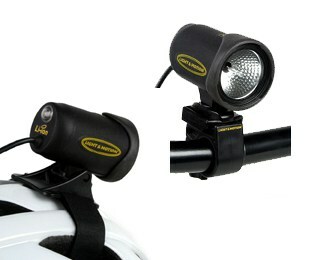 The promise fulfilled, Light & Motion produces the world’s first super-compact, high powered LED rechargeable bike light. 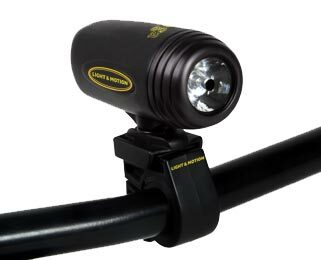 We utilize a 4 watt Luxeon™ Star Power Light Source, the world’s brightest LED offering up to 85 lumens and an incredible 10,000 hour LED life. Combine this with a T.I.R. (Total Internal Reflectance) acrylic reflector and you have a super compact 240g light that doesn’t just let you be seen, it lets you see. Asphalt, dirt, adventure or trekking; the new Stella 180-L packs a long list of features into a very small package. 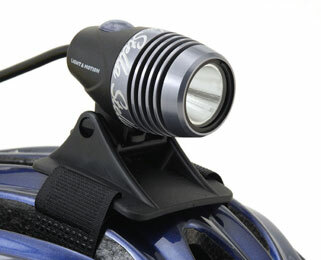 Light & Motion is proud to introduce our new super-compact, high-output LED rechargeable bike light, Stella! Simply put, Stella provides twice as much light as the comparable single-LED systems currently available. By making use of the latest LED technology, Stella provides 180 lumens of ultra-white light, burn times surpassing 5.0 hrs on the highest setting and a total system weight of 300g! This entry was posted on Thursday, October 25th, 2007 at 11:22 am	and is filed under MTB, Road. You can follow any responses to this entry through the RSS 2.0 feed. You can leave a response, or trackback from your own site.